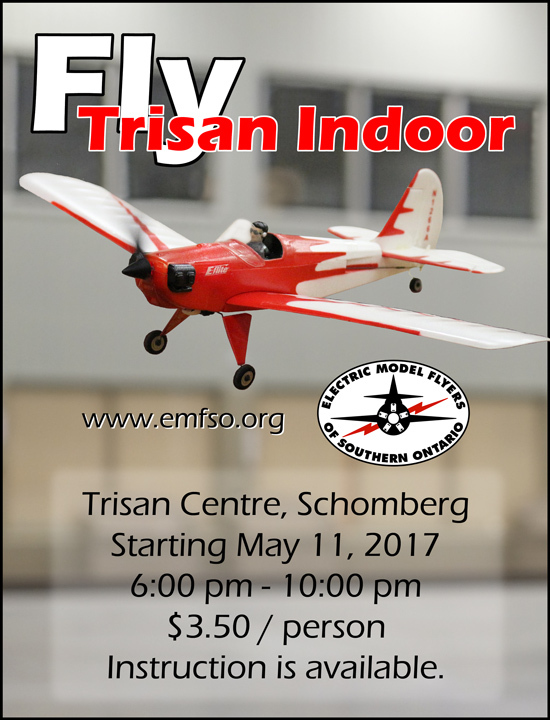 The first session of Trisan Centre Indoor is Thursday May 11, 2017 6:00 pm - 10:00 pm. $3.50 per 4 hour session. Parking is free and flying takes place in the curling rink. Well, as the saying goes "beggars can't be choosers". Going to have to get the Playmate motor replaced so I can fly it there. Everything else in the hanger is too powerful to fly in a curcling rink, unless I can dco a tight Immelmann turn. I will try to be at Trisan by 7pm. Well, Isaac got my copter into the air and validated that I got agood deal. Only recommendations are to reduce the rudder throw by about 50% bd to apply some trim to control the drift in the forward/backward plane. Got a picture but with the copterhalfway between us, the software grabbedIsaac as the focus pint. Considering that we were about five feet apart with the copter about halfway between us, no bad. Thanks, Isaac! BTW, feel free top grab this for the gallery.